Many folks have shared their treasured Rock Island postcards for this series and this is no exception. The Real Photo postcard of a house at 4509 8th Avenue comes all the way from St Paul, Minnesota, thanks to Robert Stumm. Mr. Stumm is not only a postcard collector but he has also written a book about some of his postcards. The book, which follows an imaginary steamboat journey from St. Paul to Cairo, Illinois, is illustrated with over 200 vintage postcards, many in color. It is called “A Postcard Journey Along the Upper Mississippi” is available from Amazon. Research in city directories shows this postcard house was built about 1906, only a couple of years later than the houses on either side of it. Since Zion Lutheran Church, now St. John’s, can be seen in the background, this photo was taken after 1907 when the church was built. Today that church view is obscured by newer garages and homes. The original owner was Charles Norrman, a carpenter, and his wife Carolina. The Norrmans, who later spelled their name as Norman, had many children. Although city directories list only adult children, nine different Norman names appeared over the next twenty-five years. The Norman women worked variously at McCabe’s, Augustana Book Concern, and for the telephone company, while the men were employed carpenters or roofers. By the 1930s, Mrs. Norman was widowed and living alone and by the mid 1940s, the house had new owners. At that time, it was converted to a duplex, with an exterior staircase added near the back. This is a simple house, typical of Rock Island houses of the era, combining a “Victorian” – more accurately Queen Anne – shape with “modern” – for 1906 – Colonial Revival accents. Victorian elements include the intersecting roof gables, the bay window framed by delicately shaped brackets below the upper projection, and the beautiful “sunrise” decoration on the porch gable. The simplicity of the overall design, the unadorned clapboard siding, the plain door and window molding as well as the Tuscan-style porch columns all reflect the popularity of Colonial Revival. It is notable that the foundation was stone-textured concrete block in an era when many foundations were still using stone. Today, despite the fact that the narrow clapboard and the window trim has been covered and the front porch has been enlarged and enclosed, this house is easily recognizable. 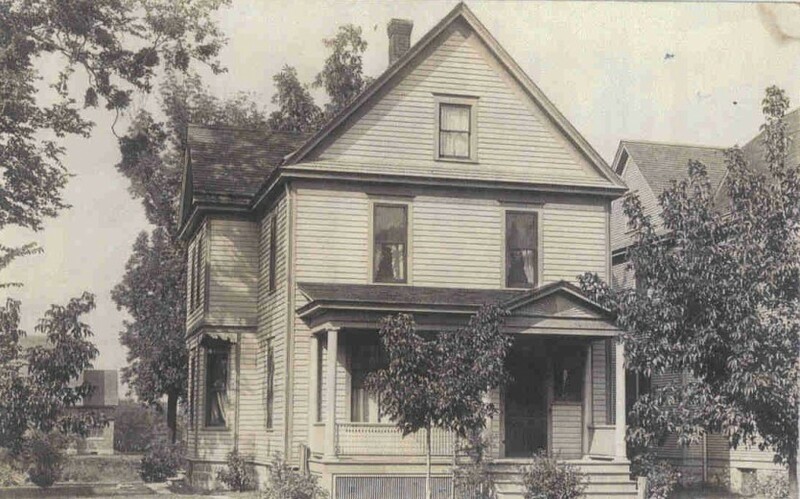 The Normans’ home was built in the Brooks’ Grove subdivision within Rock Island’s larger Keystone neighborhood. The Keystone name is venerable, having first been used by Rock Island developer and lawyer Edward H. Guyer in the early 1890s. Mr. Guyer, whose own Rock Island home at 21st Street and 8th Avenue has already been part of this series, had a great vision for this “key” location midway between the downtowns of Rock Island and Moline. Because it was elevated above swampy riverbanks, with “good drainage and a cool and bracing atmosphere,” he believed it ideally sited for a new city of 60,000. His vision was comprehensive as he planned for government offices, a railroad depot, and cultural amenities, all within the means of working families. Obviously Mr. Guyer’s Utopian city never developed, but the area did grow under several other developers. One of these was William E. Brooks, who subdivided, platted, and developed the land directly east of 44th Street, which he called Brooks’ Grove, between 1900 and 1923. Brooks’ Grove lots had a mostly north-south orientation, in contrast to the east-west orientation of lots in the adjacent other Brooks subdivision just west of 44th Street, that he called Edgewood Park. Many homes in Brooks’ Grove are nearly identical to our postcard house. However. there are a wide variety of other architectural styles that can be seen here as well, including perhaps the greatest concentration in Rock Island of that uniquely midwestern home, the American Foursquare. This article by Diane Oestreich is slightly modified from the original, which appeared in the Rock Island Argus and Moline Dispatch on November 2, 2003.